Surrounded by turquoise waters and white sandy beaches, Sardinia makes for a perfectly relaxed lazy beach holiday. The lazy part ends at the steep limestone cliffs that mark the Bay of Orosei. 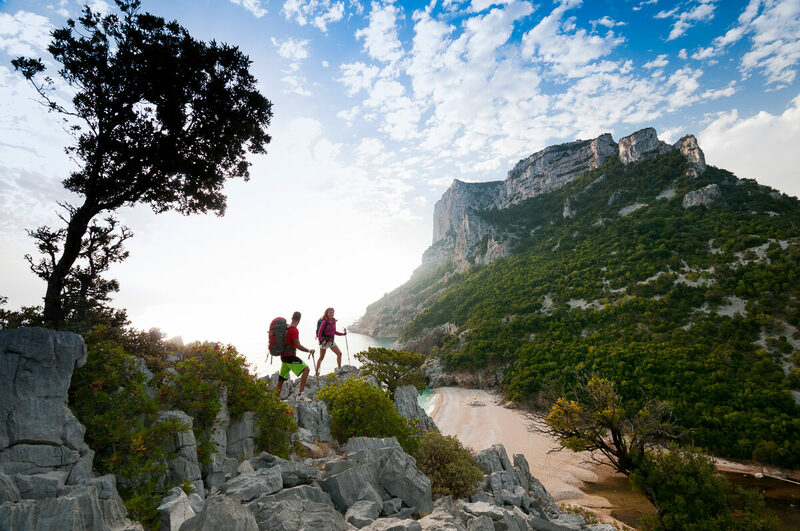 Once the territory of pirates and smugglers, this wild landscape nowadays sets the stage for all types of outdoor enthusiasts, offering great hiking, canyoning, climbing, via ferrata and sea kayaking. On a hill, slightly north of Orosei, lies Camping Porto Sosalinos, a stone’s throw from small intimate beaches nestled between the rocks. 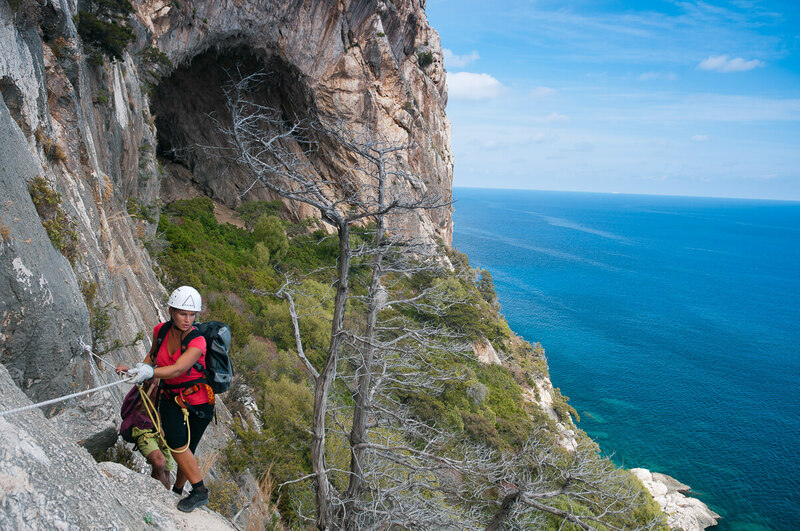 Owners Beate and Roberto have carried on a family tradition, a piece of land by the sea, naturally terraced and in a perfect location to reach some of the most outstanding scenic locations for climbing, caving, canyoning, hiking, simply all the outdoor adventure you could imagine. 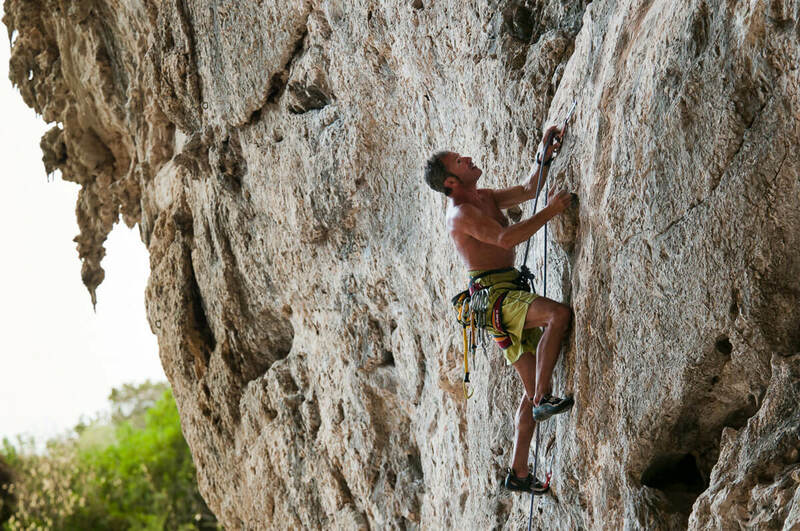 This is where we meet Enzo Lecis, the famous rock climber from Sardinia, who is responsible for bolting the majority of the climbing routes in the limestone rocks of the island. Next to his climbing passion he also uses his expertise in guiding adventurers through the canyons and via ferrata. Enzo is a one man show and does not have a fancy minibus, only a battered Fiat Panda and, to this point, I have not been able to spot a T-shirt on his leathery brown skin that bulges with steel hard climbers muscles. We check in with Enzo on our first day to make attempts at a schedule for the coming days. Enzo is a man of contrasts. He is chaotic yet detailed, free and open yet precise, and above all exuberant, passionate and professional. We drive with two small fiats loaded with all our gear and three other enthusiasts from the camping. We are on route to the Riu Pitrisconi canyon but must first stop at the local supermercato to load up on some panini with prosciutto crudo and cheese. An hour later, as the two fiats crawl straight up the switchbacks of a bouncy dirt road, it becomes obvious why a minibus does not work for Enzo. It simply would not make it to the forestry service hut! Despite the rocky ride, the scenery of mountains and deep canyons is spectacular. Barbara lets out a muffled scream but then starts making her way down the rock. Riu Pitrisconi is a beginner level canyon. 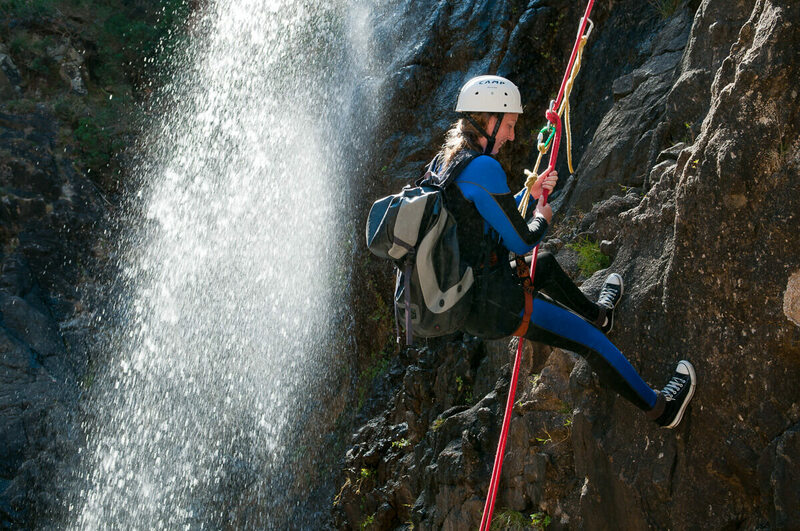 In 4 hours we jump and abseil through a landscape of rocks and water. At the end of the canyon we make our way up an ancient trail through wild scrubby landscape passing a small cave that used to be a shelter for the charcoal burners. Centuries long deforestation to make charcoal for the steel industry has taken its toll on the once forested mountain landscape, but recent reforestation is taking over the landscape again. Once back at the hut, we hungrily dig into our panini while Enzo pulls out a few well deserved beers from a cooler in the car. It is a happy end to a great day. We have tried to get hold of Enzo back at the camping to thank him for such an incredible experience and plan for the next day. The problem is that he is not one to sit still for very long! Perhaps a beer in the camp’s bar will entice him. In the span it takes to drink his beer, we learn that Enzo was once a professional spear fisherman. Armed with his spear, a camouflaged wetsuit, mask and lungs filled with air, he would dive to great depths to spear large fish for sale to the local restaurants. It was only at his 29th year that a friend took him out climbing. 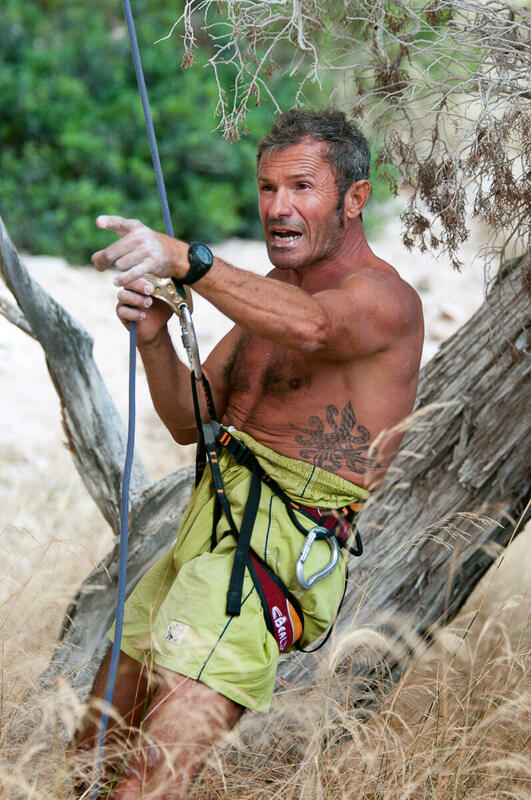 Nowadays, at 57, he is one of, if not the most famous climbers of Sardinia who is responsible for bolting many of the island’s routes and thus attracting climbers come from all over the world, who want the opportunity to meet and climb with Enzo. Enzo has decided to show us some of his labour of love. 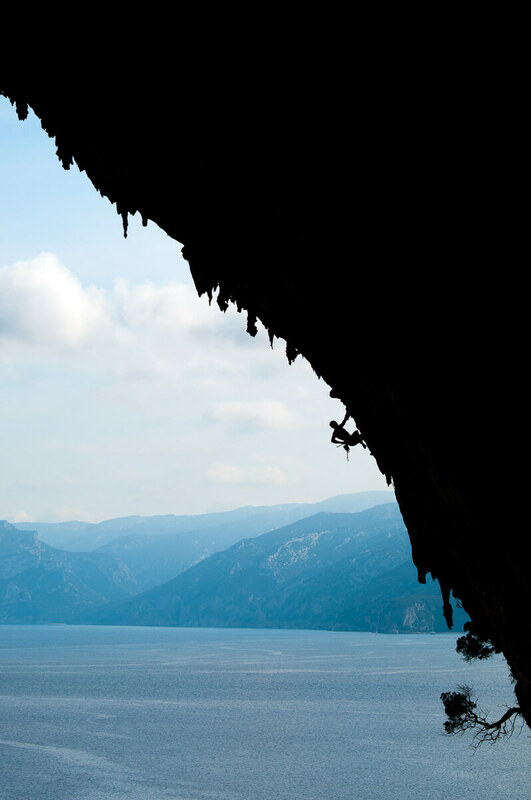 The Millenium Cave at Cala Gonone is where he was the first to bolt a climbing route. To get there we must conquer a via ferrata. It is not very large but, without question, incredibly spectacular. Via ferrata literally means Iron road. It is a steel cable attached to the rocks onto which you attach your carabiner from your harness. 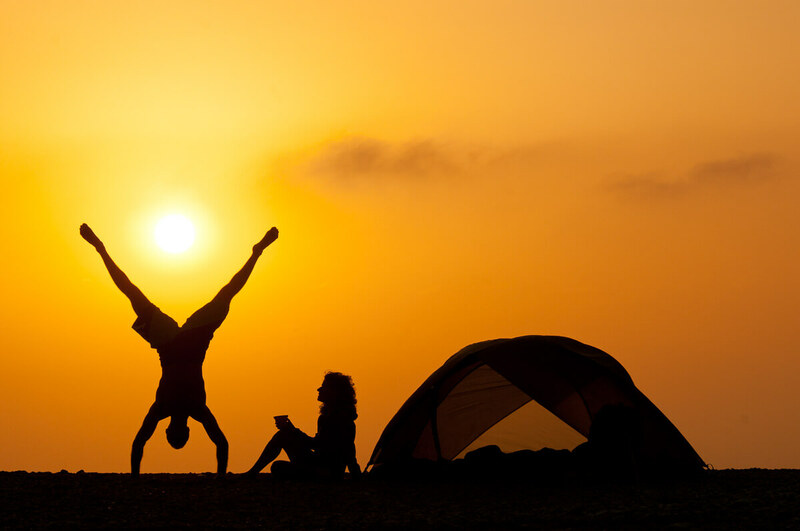 It is a good alternative for non-climbers to safely do something different than hiking. Almost immediately we find ourselves hanging onto a rock directly above the sea. My toes shift over a ledge in the rock. When I look down I watch stones fall far below into the sea. The weathered sign next to the bumpy mountain road says ‘Refugio Ovile Carta’. An ‘ovile’ is a typically round, traditional shepherd’s hut made out of limestone topped with a rough juniper wood roof. This is Giampietro’s home. As he is busy pouring yet another glass of homemade wine he explains, “This ovile has gone from generation to generation. I have lived here all of my life with my family, taking care of the livestock; 10 cows, 10 sheep and 60 pigs, last count. The sheep give us milk for the cheese, the cows provide milk and meat and the pigs our bacon and sausage.” Outside it begins to get dark. We retreat to the kitchen where Giampietro is preparing homemade ravioli filled with a delicious portion of his own sheep’s cheese. Here on the farm everything is prepared fresh. 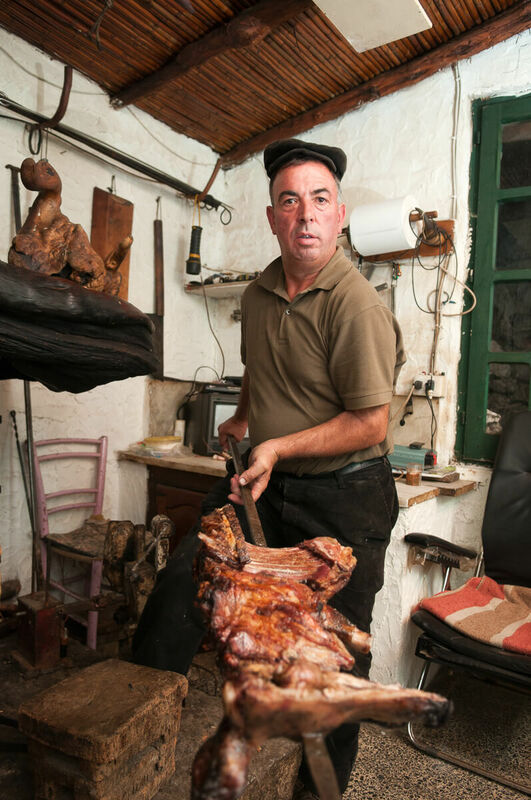 In the adjacent room there is a suckling pig roasting over the wood fire. “The free range pig must cook slowly for four hours. It only needs a pinch of salt as during the pig’s entire life he has been munching on all the mountain herbs and acorns in the wilderness.” Before the main meal we manage a large plate of two year old ham and bacon. Then we begin on the ravioli and by that time we wonder whether or not there is even space for the ‘not to be missed’ roasted piglet! As far as we are concerned the meal has won the highest of honours, even a Michelin Star. It seems only fit to finish it all off, for the digestion of course, with not one but perhaps a few special grappa. I seem to have trouble reminding myself that we did come here to hike! We come across a deserted shepherds hut. There are no goats around but their bells are distinct in the distance. 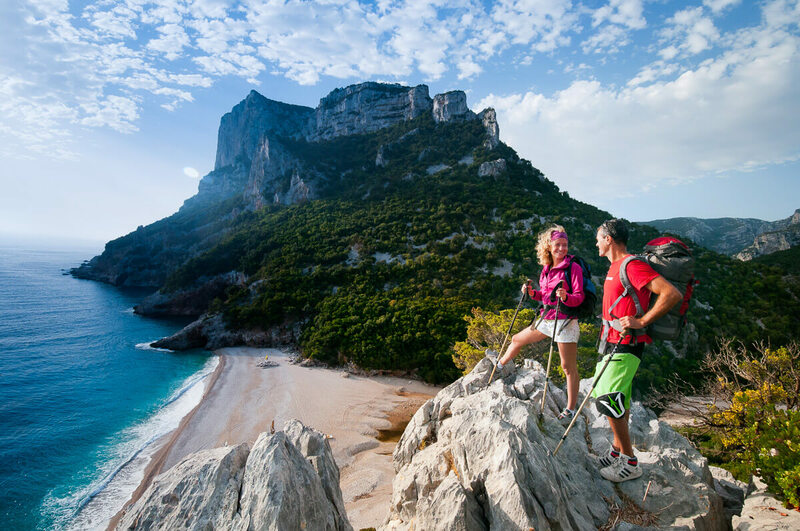 After one hour hiking we find ourselves on top of the Aguglia, an impressive rock pinnacle that stands tall directly over the beach of Cala Goloritze. Unfortunately pea soup like fog blocks the view over the Gulf of Orosei. We pass San Pietro church on the Golgo plateau, host to century old olive trees. We are greeted by two donkeys who seem to be more curious about our presence than we are theirs. From this location it is approximately four hours to the beach of Cala Sisine where our friends Beate and Roberto from Porto Sosalinos wait for us with all supplies for camping overnight. They have arrived by boat with other friends and family. We leave the dirt track, climbing up to the view of Urele. Left and right of us the pigs quickly scamper into the bushes. Over the blue waters along the coastal landscape, at 300 meters high, the clouds lift, releasing a blue sky to reveal the spectacular beauty that surrounds us. A total gift compared to yesterday. If we would have followed the signs to Cala Sisine this gift would never have be ours. Our route has remained high with spectacular vistas, until the last moment when we dive into the canyon, arriving on the beach of Cala Sisine. Here Beate and Roberto are waiting. They have also just arrived and seem to want exactly the same as us. A much deserved swim! 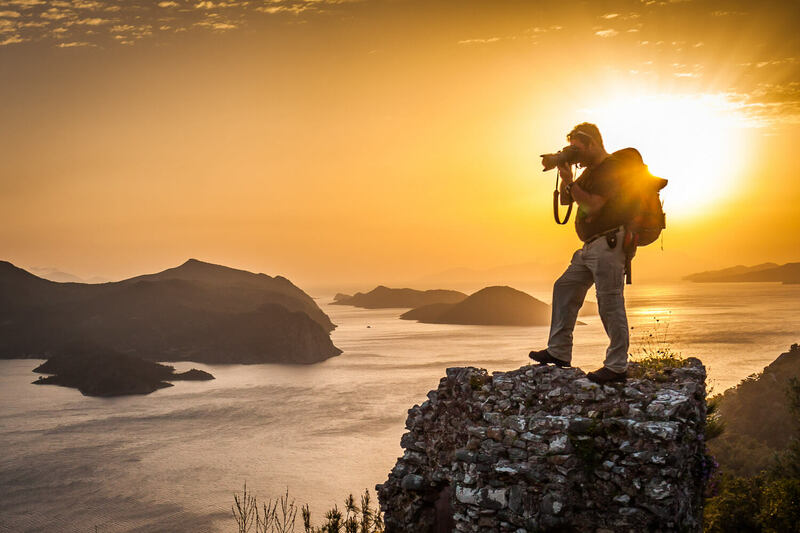 Frits is a Dutch adventure and travel photographer who earned his spurs in black & white documentary photojournalism in Middle East conflicts. 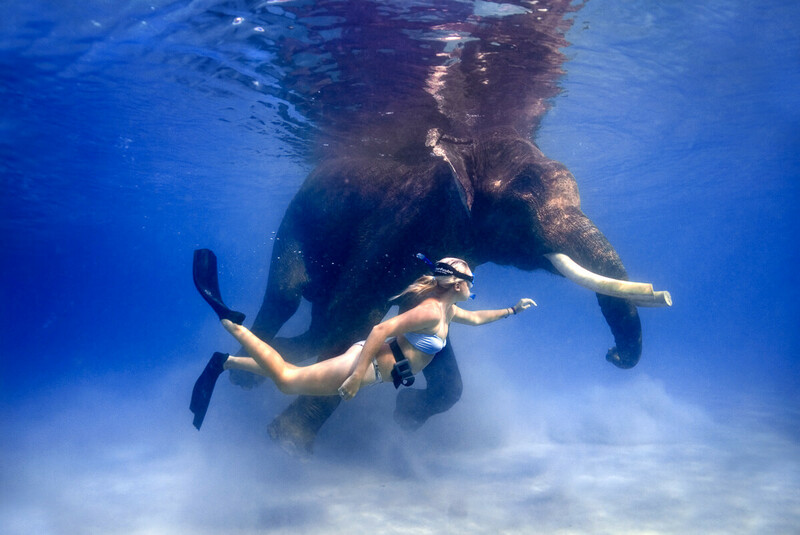 In 2004 he made a total transition to travel and adventure photography. Frits wants to inspire people to travel and experience other cultures. That is why he founded 4ever.travel, a mixed media platform for adventurous people who love travel and ‘the great outdoors’. Arctic survival in Swedish Lapland. -40C Adventure Time!